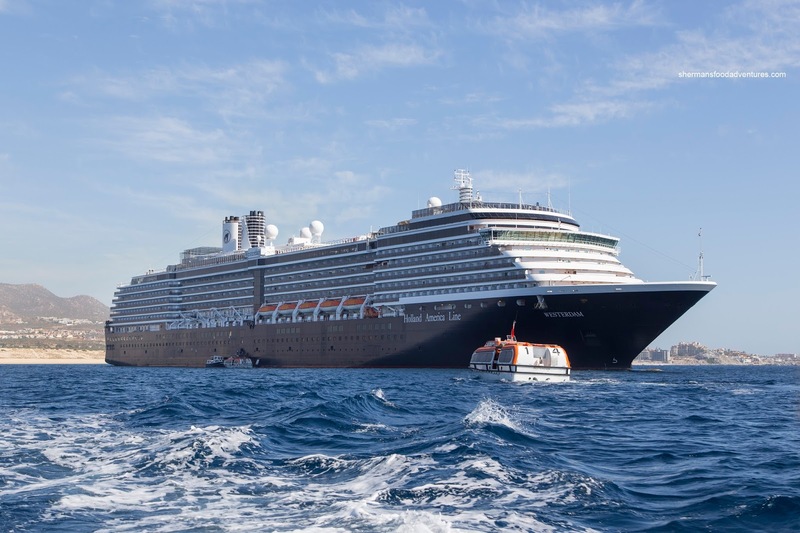 For all the cruises we've been on, not in a million years would I have thought that the cruise line that we'd be cruising with the most would be Holland America. Yes, it is true that Viv and I are no longer spring chickens, but we are also hardly their main demographic. Last time we checked, our hair hasn't gone grey and don't have grand children. But due to the fact we won a cruise aboard the MS Veendam playing bingo, it meant that our Mexican cruise would be aboard Holland America's MS Westerdam leaving out of San Diego. We were pretty familiar with the ship as it is essentially the same as the MS Oosterdam, which we sailed on to Alaska in 2012. Boarding in San Diego was a breeze partly because the cruise terminal isn't particular busy (only one ship in at the time) and we arrived pretty early. This was also facilitated by the fact we stayed across the street at the Marriott Springhill Suites. Once aboard, the rooms were already made, so we could drop off our carry-ons before making our way up to the buffet. 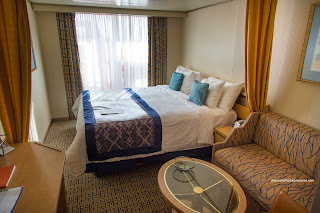 We ended up with an outside room (with an obstructed view) on the Upper Promenade Deck. Didn't matter to us as there was plenty of natural light and were not in our room very often. It was pretty standard in size, similar to other HAL ships. I did like the orientation of our bed as it made the room seem more spacious. I still do not understand the chair in the room as there is nowhere to put it and it was always in the way. The amount of storage space was sufficient for all of our clothes and belongings. 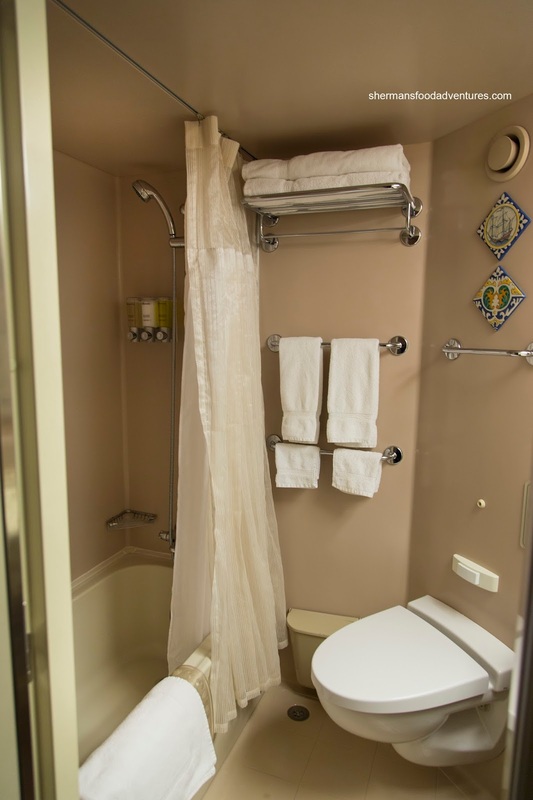 Our room came with a full tub (the small tubs found on cruise ships), but we stuck with the shower, which had good water pressure. 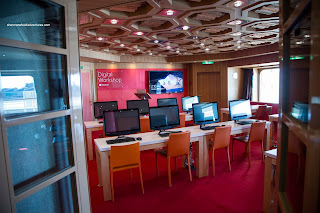 Despite not being the newest ship, we felt it was kept clean and all of the public areas were maintained properly. Being a medium-sized vessel, there seemed to be plenty of room to move about without feeling like it was crowded. Furthermore, since HAL does not have any mega ships in their fleet, lineups around the Westerdam were minimal. 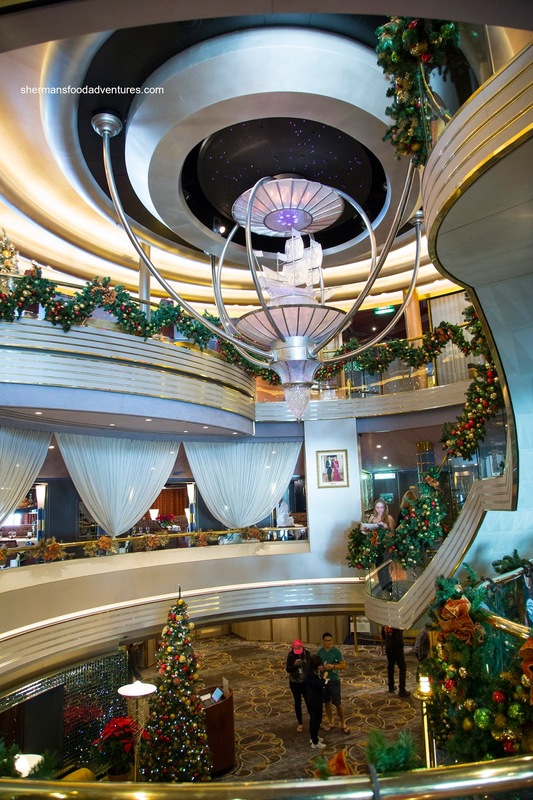 As with all HAL ships, the decor was classy with traditional colors. 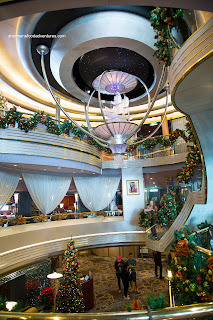 As you can clearly see in the pictures, this was a holiday cruise where Christmas decor could be found throughout the ship. Despite the use of soft and neutral colors, the ship didn't feel old due to some renovations and addition of technology. One new addition was America's Test Kitchen where live demonstrations emulated the TV show. We did catch a couple of them and they were entertaining with a lively host and interesting recipes. At night, it became a blues club and the house band was fantastic. 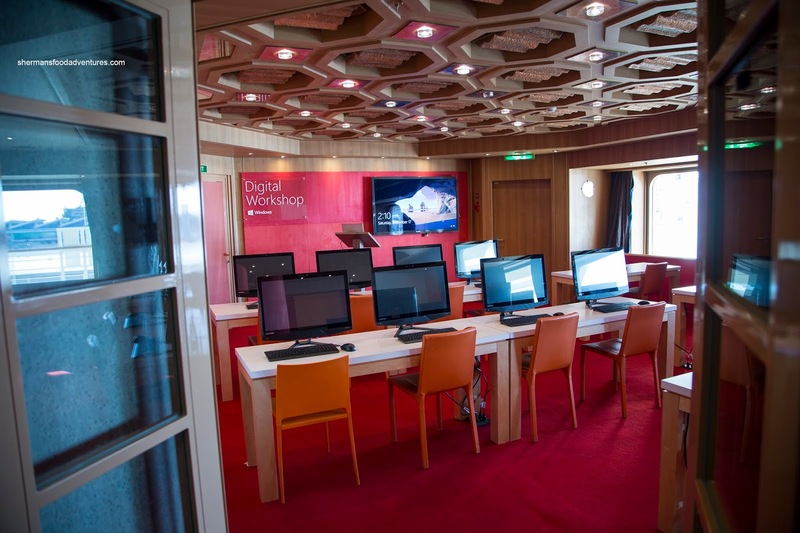 In terms of the other on board entertainment and activities, they were the usual team trivia, music trivia, crafts, technology seminars and the sort. Viv and I were amused at the music selection for name that tune as it was pretty ol' skool, even for us. That was the same for the movie trivia too. Again, the line appeals to an older demographic. 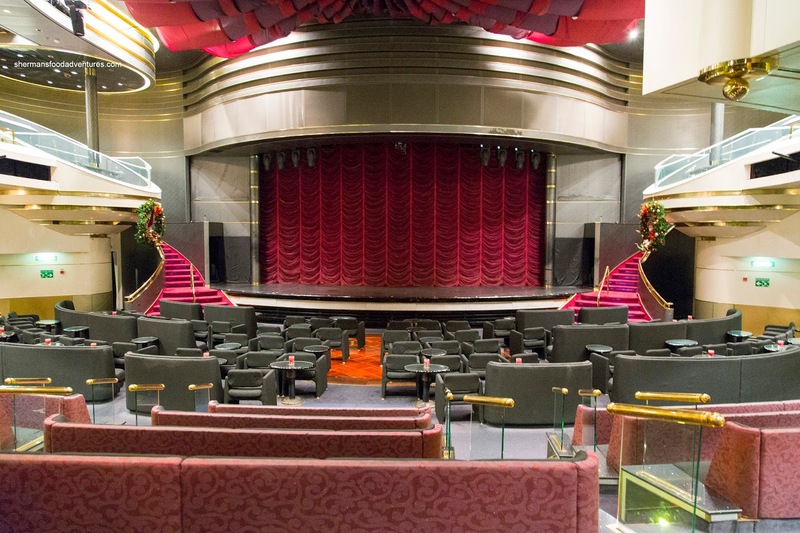 We found the theater to be relatively spacious for the size of ship and we never had a problem finding a seat to watch a show. With that being said, the lounge-type seating in the front section could get a bit squished depending on how the movable seats were arranged. 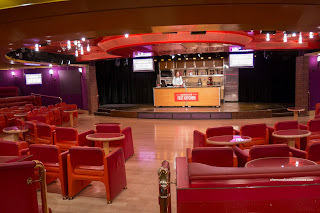 In terms of the food, it was pretty much as expected where it was decent for a cruise ship but still had various issues. However, the meals that cost a surcharge were generally better. Overall, the cruise was enjoyable and the mid-sized ship provided enough space and venues for everyone. Personally, we found the lack of on-board activities for more active cruisers a negative. Again, we are not exactly their core demographic either.